To get started immediately as an AMSOIL Dealer, REGISTER ONLINE NOW . Jump start your AMSOIL business by signing up with us. You'll be eligible for exclusive benefits and training only available here. We help our downline more than anyone else in the business. We also have lots of tips on how to increase your sales that could save you a lot of time, effort, and money. To request additional information about becoming an AMSOIL dealer directly from AMSOIL, please click here. The yearly cost to be an AMSOIL dealer is only $30. The AMSOIL dealership works very much like all other multi-level marketing programs (Mary Kay, Avon, Pampered Chef, etc.) where you earn direct profits from sales and a monthly commission based upon sales volume. AMSOIL offers numerous incentives as you reach higher levels of achievement. There are no obligations, commitments, minimum sales requirements, etc. You can put in as little or as much effort as you would like. However, as with any job or business, the AMSOIL Dealership does require a great deal of effort and patience to really be successful. For more information on all the different ways to earn money as an AMSOIL dealer, see below. Earn profits through retail sales. As an AMSOIL Dealer, you purchase AMSOIL products at Dealer cost and then sell them at the suggested retail price. Your income starts building immediately with retail profits! You also earn monthly commissions on your purchases from AMSOIL. Earn profits with catalog sales. You can also sell AMSOIL products with the AMSOIL Retail Catalog Program. Catalogs can be purchased directly from AMSOIL and then distributed to potential AMSOIL customers. Once the catalogs are in the hands of your potential customers, any sales made will earn you retail profits and commission credits automatically. Order taking, shipping, and returns are all handled by AMSOIL INC. Earn retail profits and commission credits with online commerce. The AMSOIL Online Store offers customers the convenience of ordering AMSOIL products over the Internet. As in the Retail Catalog Sales Program, products are sold at suggested retail price and AMSOIL Dealers earn the retail profits and commission credits. Order taking, shipping and returns are all handled by AMSOIL INC. AMSOIL also offers website packages and other options that allow all Dealers, regardless of computer experience or equipment, to participate in Internet sales. Multiply your profits by building and managing your own sales group. When you sponsor new Dealers and Preferred Customers (just like you would be sponsored as a Dealer) you are building a "downline group." The commission value of your group's purchases is added to yours, increasing the percentage of your commission and giving you a bigger commission check. The primary difference between Dealers and Preferred Customers is the right to earn commissions. Dealers earn commission checks based upon their commission credits and the commission schedule. Preferred Customers do not earn commission. All commission credits earned by Preferred Customers are credited to the sponsoring Dealer. Commercial accounts are a great opportunity for AMSOIL sales. Earn 10% cash commissions plus 20% commission credits. * Commercial accounts can provide a steady source of income for an AMSOIL Dealer. Commercial accounts are businesses which have company-owned vehicles, equipment and machinery that use the quality lubricants and filters available in the AMSOIL product line. These accounts do not sell AMSOIL products, but choose to use them in their equipment and machinery. When you register a commercial account, you earn a 10% cash commission on every purchase your account makes. 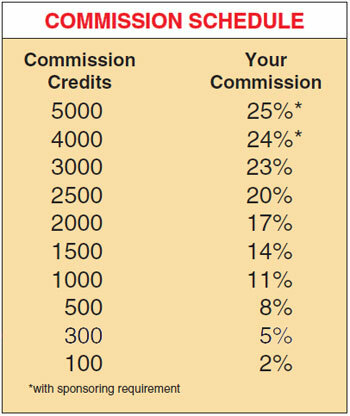 In addition, you also receive 20% of their purchases as commission credits which are applied to the commission schedule and added to your commission totals. More profits in retail markets. Earn 20% cash commissions plus 20% commission credits. * Selling AMSOIL to retail accounts is another way to earn commissions. Retail accounts are retail outlets such as auto parts stores, motorcycle dealerships and automotive service centers. These stores stock AMSOIL products to sell to their customers or install AMSOIL products as part of a service such as with oil changes. When you sign up a retail account, you earn a cash commission on every purchase your account makes. If your retail accounts purchase XL 7500 motor oils and Hastings Filters, you will receive 15% cash commissions. All other purchases earn 20% cash commissions. In addition, you receive 20% of their purchases as commission credits which are applied to the commission schedule and added to your commission totals. Click here to see the complete business opportunities (pdf) file for more details.